The CIRI Human Rights Data Project has released its ratings of government respect for 16 internationally-recognized human rights in almost every country in the world for the year 2011. The CIRI Project’s data stretch back, annually, to 1981 and can be freely accessed at www.humanrightsdata.org. The CIRI data are used by governments, scholars, international organizations, businesses, think tanks, and students the world over for a variety of purposes. The project is co-directed by Dr. David L. Cingranelli (Binghamton University), Dr. David L. Richards (University of Connecticut), and Dr. K. Chad Clay (University of Georgia). This data release has also been accompanied by a number of changes at the CIRI Project. A new country was added to the data for 2011 (South Sudan), and, reflecting the addition of a new co-director (K. Chad Clay) in Fall 2012, the project’s citation has changed. Perhaps most importantly, CIRI’s release schedule has changed. In the future, data updates will be issued annually in January to cover the year that began two years previous. As such, the 2012 ratings will be released in January 2014. All 14 of CIRI’s individual indicators of particular human rights can be summed into an overall human rights score for each country in the world. The best score a country can receive is 30, representing high respect for all 14 human rights; the worst score is 0, representing very low respect for all 14 human rights. The world average was 17, and the USA scored 24 (tied for the 7th highest score, but still ranking behind 37 countries). Below are the best and worst of 2011. Beginning in Tunisia in December 2010, the wave of demonstrations, protests, and conflicts known as the “Arab Spring” swept through the Arab world in 2011. What effect did this have on respect for human rights in the Near East and North Africa (as defined by the US State Department)? 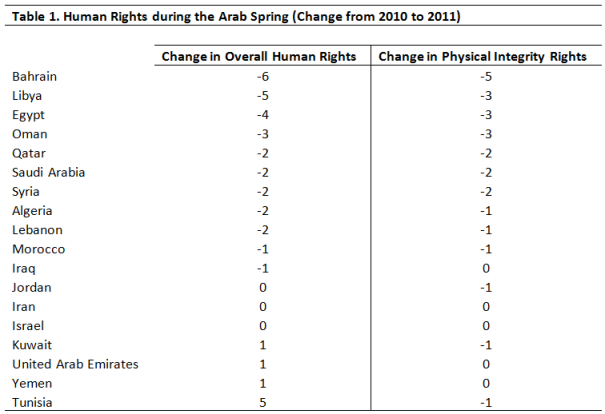 Table 1 displays the change in the overall human rights score, as well as in the CIRI Physical Integrity Rights Index, from 2010 to 2011. As can be seen, most states in the region demonstrated reduced respect for human rights in 2011, particularly those states that experienced some of the highest levels of unrest that year, e.g. Bahrain, Libya, and Egypt. Of course, other states, like Syria, Yemen, Saudi Arabia, and Iran, already had extremely low scores on our indicators and thus, had little room to move down. On the other hand, Tunisia experienced a large increase in its overall human rights score, owing to the overthrow of its government early in the year and the elections held in October. However, this was not enough to overcome the high level of physical integrity rights abuse that accompanied the protests early in the year, which led to a decrease in respect for physical integrity rights from an already low score of 3 in 2010 to 2 in 2011. CIRI also annually codes two measures of internationally-recognized women’s rights: women’s political rights and women’s economic rights. The women’s political rights measure is aimed at capturing the degree to which government laws and practices ensure that women enjoy the rights to vote, to run for political office, to hold elected and appointed government positions, to join political parties, and to petition government officials. The women’s economic rights measure captures the degree to which government laws and practices ensure that women enjoy equal pay for equal work, free choice of profession or employment, the right to gainful employment, equality in hiring and promotion, job security, freedom from discrimination by employers, freedom from sexual harassment, and the right to work in dangerous professions, including working at night and working in the military and police forces. 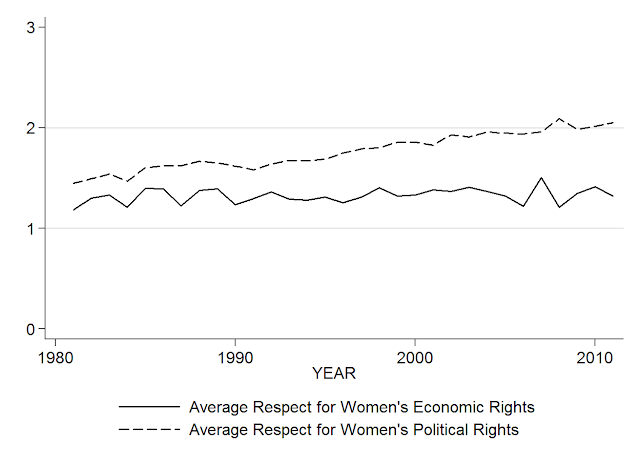 Our two measures of women’s rights moved in opposite directions in 2011. While women’s political rights improved for the second straight year, women’s economic rights suffered a setback after two consecutive years of improvement. Indeed, this is in keeping with these measures’ performance over time. 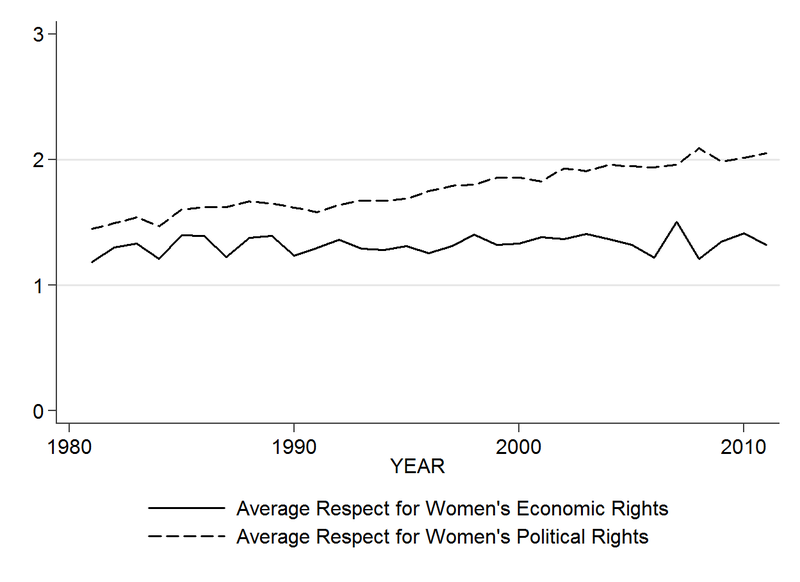 As shown in the graph below, respect for women’s economic rights has lagged behind respect for women’s political rights consistently since 1981. However, that gap has widened with time, as respect for women’s political rights has consistently grown while respect for women’s economic rights has remained relatively flat. Note: The shapefile used to construct the above map comes from Weidmann, Kuse, and Gleditsch’s cshapes, version 0.4-2. The map was made using Pisati’s spmap package in Stata 12.1. Another version of this post can be viewed at the The Quantitative Peace. Starting this fall with the release of our soon-to-be-announced web features, CIRI will be beginning a series of human rights-education initiatives. For the first of these endeavors, we are attempting funding via crowd-sourcing. If you are able to contribute, or know anyone that can, we'd certainly appreciate your support. If this initial project succeeds, we have a host of exciting further ideas for promoting human rights education in high schools. For your contribution, you can probably receive some free CIRI swag, maybe immortality on our website, but most-definitely our eternal thanks and the knowledge of doing some good by raising knowledge/awareness of human rights! The goal of the CIRI Human Rights Education Initiative is to produce human rights-based lesson plans for use in high school classrooms. Funds will be used to pay an advanced Ph.D. student to work with high school social science teachers under the supervision of CIRI Co-Director Dr. David L. Richards to develop human rights-based lesson plans during the summer of 2014.These lesson plans will be made freely available on the CIRI website. Which human rights are most-respected and/or violated by governments around the world, and why? How can we compare countries' respect for human rights both across geography and over time? What can be done to better-protect human rights? What is the state of human rights in the USA? By using CIRI data to address many of these questions, students will also learn and hone crucial evidence-based/critical thinking as well as quantitative-based comparative and comprehension skills. Our campaign total is based on: (1) the cost of a half-time graduate research assistant for one summer (77% of total funds requested for campaign); (2) expenses related to working with high school teachers on lesson creation; (3) web-based distribution costs; (3) miscellaneous supplies. The goal of the CIRI project is greater respect for human rights fueled by greater awareness of human rights, and we can't think of a better starting point than the high school classroom. Human rights education has come a long way at colleges -- to the point where it is now a major of its own. However, human rights on its own is just a budding subject in high schools. By combining a data-based approach with human rights education, the CIRI Initiative's lesson plans will meet dual needs: topical coverage of human rights and an introduction to quantitative comparison/analysis and evidence-based decision making.